All amazing events start with an invitation. 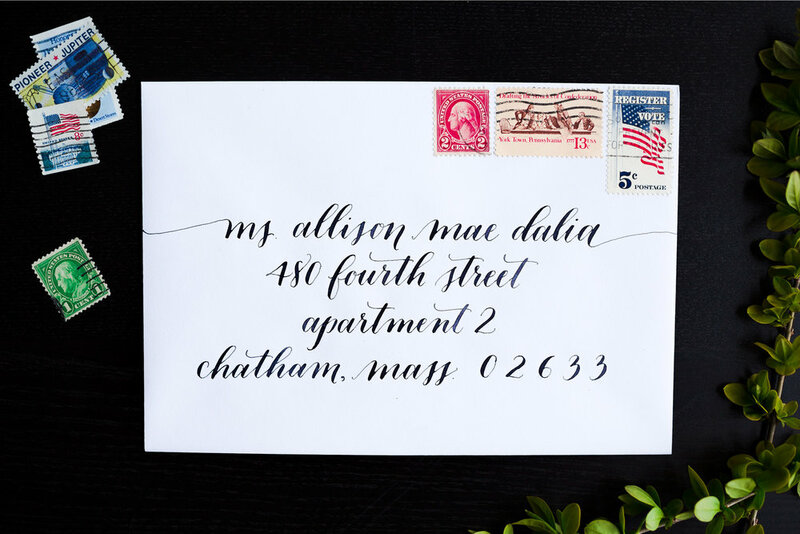 Make yours memorable with Manayunk Calligraphy! I specialize in modern pointed pen and brush techniques, offering styles in a variety of moods and price points. Your big day is a big deal. Whether it's a black tie wedding, your annual holiday soiree or a casual birthday bash, you'll find a style just perfect for your event. Click the photos below to enlarge. Please tell me a little more about your event, including your color palette and any special requests. Thank you! Someone will reach out to you via email shortly. Add an additional $0.25 for metallic or gold ink. + I am interested in booking you. Now what? Please submit your inquiry via the online form above, and our wedding specialist will get back to you as soon as possible. To secure your spot on the calendar, you'll be required to submit a non-refundable $100 deposit that will go toward your final fee. Orders of 175 envelopes/cards or less require a minimum of two weeks to turnaround; larger orders require a minimum of 3 weeks. Schedule availability may affect turnaround time, but this will be discussed and agreed upon prior to signing a contract. + I should have ordered these, like, yesterday. Do you take rush orders? Absolutely! A 20% fee will be added to any orders that must be completed within 2 weeks of receipt of the items (envelopes, place cards, etc.). A 40% fee will be added to any orders that must be completed within a week. Please contact me directly at kim@manayunkcalligraphy.com if you have an order that needs to be rushed. + Do I supply the envelopes (place cards, etc.) or do you? Generally, that's all you! Chances are, your invitation suite comes with corresponding envelopes, place cards, etc. -- using these envelopes ensures everything will look uniform. In cases where you would like me to provide the materials, please note I order all paper supplies through Waste Not Paper - they provide a variety of color options! + How do I get you my envelopes (place cards, etc.)? If you are located in the Indianapolis area, I would encourage you to swing by Irvington. One, because it's a great place to shop, grab pizza at Jockamo's and a drink at Black Acre, and two, because it's where my studio is located. If you are located outside this area, you can ship them directly to my studio. When they're all finished, I'll package them up with care, and send them back to you USPS Priority or UPS, whichever your prefer. You will be responsible for shipping costs. + How do I pay? Do you require a deposit? Once we have agreed upon how many items you need addressed/labeled, I will send you an invoice for the order. You can pay using a credit card via PayPal, or with a personal check. If you pay with a personal check, I will begin work as soon as the check clears. 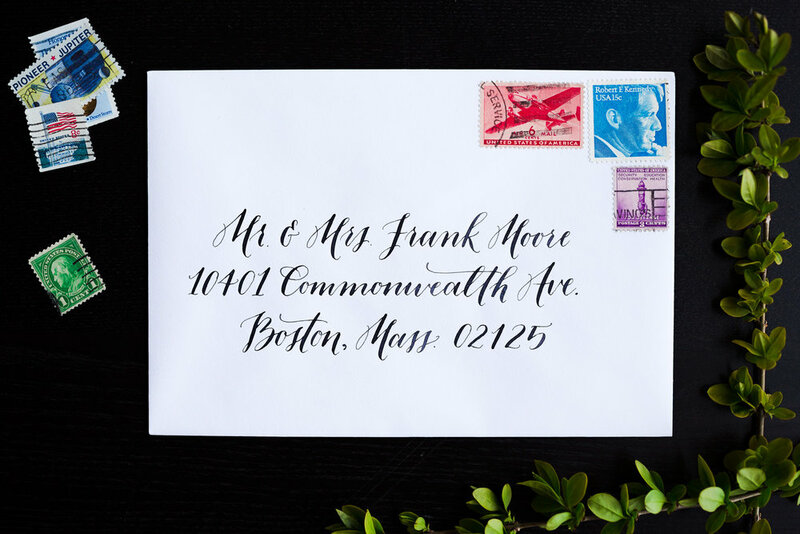 Know you want to work with Manayunk Calligraphy, but don't have your envelopes or final list of addresses ready? No worries! To secure your spot on the calendar, I require a $100 deposit that will be put toward your final order. In case of cancellations, your deposit will be fully refunded only if it is within two weeks of your initial order. If it is cancelled outside this window, you will not receive a refund. The reason for this is that your reservation on the schedule means other couples must be turned away - if you cancel, that leaves an empty spot and a major bummer. + Anything else I should know? Why, yes! Here's the thing: ink, while wonderful and beautiful, is a fickle beast. It smudges and blotches, but hey, I love it anyway. And since no one wants a smudgy, blotchy invite, I ask that you send at least 20% more envelopes (place cards, etc.) than needed. That way, if ink misbehaves, I have some back-ups to ensure your order comes out perfect.